Will the iPhone 5 have 4G? Is there a 7″ iPad in the works? Will the next Samsung Galaxy device support telepathy? Will the next Motorola Droid support teleporting? If you are a regular reader of tech blogs, (and stopping by here is probably a strong indicator that you are), then you’ve heard your share of tech rumor bullcrap. A lot of sites rely on third parties that can’t give up all the juice for fear that they would lose their jobs. Other tech sites simply produce great looking documents using photoshop, and then some are too lazy to do any fact checking. Outside of that, every once in a while, legitimate “ninjas” or internal sources actually get something mixed up or a leak they have gets shelved. Well have you ever tried to keep score? Sites like The Verge, Engadget , Tech Crunch and Business Insider try and keep score on the hottest rumors about the hottest gadgets, all the while keeping people grounded in what they believe is the truth and what they believe is a little fiction. Now, you guessed it, there’s an app for that. 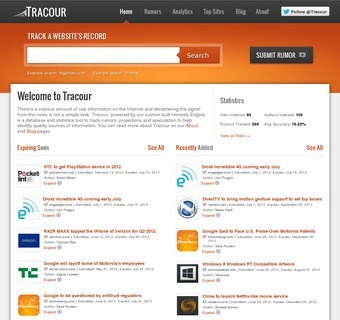 Cincinnati based Tracour was first reported on by our friends at TNW. The premise is simple. The platform functions as a database of sorts then it collates technology rumors and attributes them to their respective authors. When it’s all said and done and it’s time for the rumor to come out, or the device to be released, Tracour keeps score of how correct the rumors actually were. Brad Sams, the creator of NeoWin and Tracour has his work cut out for him. There are a lot more bloggers, analysts and journalists than there even were two years ago. Just think 18 months ago everyone at The Verge worked at Engadget, Mike Arrington was still pretending to be happy at AOL and there was no Pando Daily. Tracour is actually a great tool for other blog authors and of course readers. In our days of publishing Thedroidguy while we produced a ton of fresh content everyday, we often went late on the “rumor dejour” because they hadn’t been vetted properly. Sometime it meant we missed a story and other times it meant we saved face by not publishing some ridiculous nonsense. TNW actually does a great job of not pushing the crap out but with Sams’ tool you’ll be able to visualize an author or websites credibility. In a day and age when even the New York Times and the Wall Street Journal have pulled the trigger on a loose lead, Tracour will be a welcome edition to the blogsphere, and of course for others that rely on their fake informants and photoshopped documents, their antics will now have a scorecard. Bravo Brad and Tracour!